+ building a solid team, to be strong and to show Renraku that maybe it’s cool if I were a red samurai and show my (dead) parents that you don’t need to be experimented on if you have a solid team at your back. Salt Crumblebox, R3, Security Consultant, R3 gun license. Roltox Cambot, R1, Unemployed. For “illicit” uses. Asura Ito, R4, Private VIP security for “legit” uses. R4 gun license. Kiku Moto, R4, burned in ACHE. her parents, and what did she inherit from them? Ro inherited everything from her parents. More than she asked for. Her parents, along with a group of a couple dozen other bright stars in Renraku, felt that non-human metatypes were getting an unfair edge on the future of corporate leadership. Finding the best genetic pairings in their human posse, they each had children, and gave unto those children the best in genetic enhancements. Ro was the “runt”, only achieving 86% of her expected potential as a baby. What followed were years of arduous school and training. It was clear that the children were being raised to be the next leaders of Renraku. There was no name for the group, no clear lines of any sort of an organization. 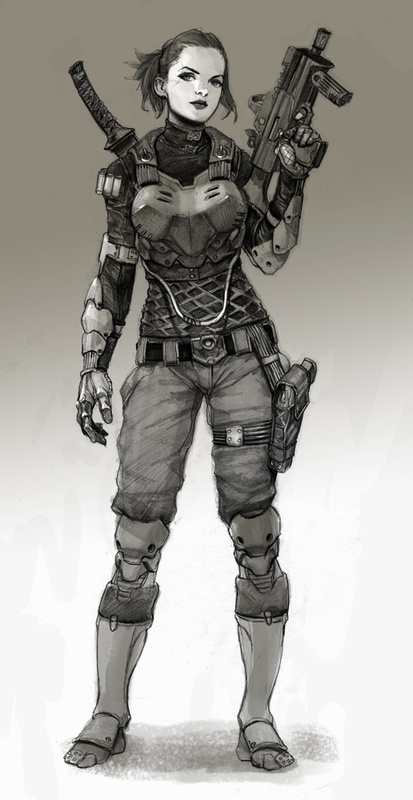 Ro had been designated for the Red Samurai, and would ultimately come to lead the elite security. As her acceptance came through, the rest of her life fell apart. Her parents, and the others in the group, were discovered. They completely disappeared, and nobody ever bothered to tell Ro their fate. Murdered? Extracted? Maybe worse. them into the world. Some are loving, and some are indifferent. of your character’s parents say about her? Her mother would say that even with only an 86% success rate, her child was still better than the rest of those unnatural meta-types. Then the mother would go back to her genetic research. Her father was more of a managerial type, and at least knew how to fake being affectionate. Ro often wondered if her father even realized that he was faking it, not remembering him having an earnest emotion with another living being in as far back as she could remember. He showed admiration for her when she would boat with him, at the very least. Ro is resentful that she enjoys boating so much, and that it is likely due to the pseudo-emotional connection with her father. the emergence of technomancers and artificial intelligences. event, and what was he doing at the time? For most of the notable events Ro was in school, and looked at them through distant, clinical eyes. She would wonder how people dealt with these tragedies, and tried to comfort those adults around her who seemed to be more affected. Ro put herself into the positions of the key members of those historic events, and tried to analyze what should have been done to come to the best outcome. shadows, her decision is influenced by the world around her. Her future with Renraku was finished. She was no longer accepted to the Red Samurai, yet was still on the corporate roster. They literally gave her nothing to do but to sit in her new cramped apartment and rot. She was not under guard, however, and could leave and seemingly go…anywhere. She was tested many times for tracking devices but found none. Something about it seemed extremely suspicious, but it made no sense. There was no one to contact besides her mid-level Renraku liason, and he was not about to talk about her personal story (and he likely didn’t know or care anyway). So eventually she started stealing, and waited for retribution. None. She fell in with some unsavory characters and did a little bit of organized crime. Nothing. Not wanting to deal with corporate political BS, Ro decided to go independent and run in the shadows. Beats having to say “yes sir” to some upstart “crime lord”. what has he added or changed to make it his own? Home should not be work, and it designed to be peaceful and zen. That being said, with a dangerous life of a Shadowrunner, personal affects can be dangerous to have just lying around. Simple, clean, and meditative. Don’t leave anything at home that you would worry about losing forever. why does she hold them? Ro believes that her parents were bigots and were so caught up in themselves and their radical idealism that they lost sight of ever even looking for happiness. Being genetically superior, most of the other children also logically deduced that their parents were in the wrong. It doesn’t matter who you are or where you came from, it only matters what you do with the situation that’s in front of you. You can be a troll or an old human woman…as long as you’re the one with the gun, you’re in control. Power isn’t everything though, you still have to live your life. And now Ro has a unique opportunity to be free. Or at least the freedom to leave the compound. • Everyone has aspects of their personality that grate on someone. Even the best of friends annoy one another from time to time. The flaws in a person’s character are as important as the qualities. The arrogance and superiority that Ro’s parents instilled still rise to the surface at times. To counter this she has practiced a certain selflessness, risking her life for her crew more than she needs to. It could get her killed. which does he like the least, and why? Renraku isn’t evil, and it’s the only home she ever knew. I mean, certain people and aspects of Renraku are most definitely evil, but there are parts of everyone which can be terrible and corrupt. Ultimately the corps are just large gangs, led by smart people who only want to be more powerful and smarter. If you’re looking for a friend in a power-hungry entity, then you really have to take a deeper look at your own life. • People make acquaintances and friends; we’re hardwired for it. the story with your character and her contacts? Unfortunately, Ro lost connection with all of her old friends and contacts when her parents were discovered. She still has a Renraku liason who she can contact about information, services, and potential side-work. But otherwise it’s people she’s met professionally, and good people to know if you want to stay alive. until tomorrow afternoon. What does she do for the day? Exercise. Read two books. Clean the equipment. Meditate. Go to a club and have fun. she develop them to those levels? Ro picks things up extremely quickly. Most of the skills she learned now were taught in an extremely fast-paced school, and break-neck training regimens. She was being sculpted from an early age to be a perfect soldier and leader. And well, they got it mostly right. shadow work would she refuse to engage? Work is work. Ideally nobody will die. Most of the players you see on the field have made a choice to be there, and they know the stakes of the game. It’s really survival of the fittest, so you better play the game really damn well. Ro received extensive alpha grade bioware when she was young, and has had it continually expanded upon as she grew. Her parents, like mentioned before, wanted to make her and her “friends” as close to the perfect, clean, person as possible. and those who abide by it? It’s totally great to live a normal life. If it wasn’t mostly boring, Ro would be on board. But she’s in this game, and is ready to win it. But that doesn’t mean she can’t go out for a night on the town and not enjoy herself. That she was a failed experiment, and because of that 86% her parents didn’t allow themselves to love her. That they are possibly being tortured right now, because they dedicated their entire lives to an ideal, to making Ro, and that Ro is not in any way living up to those expectations. That because of the many things that have been done to her body, Ro can never live a normal life. Nothing will ever be as satisfying as doing a run, and pushing yourself to the limit against odds that are stacked against you. The only item that she can rely on is herself, and she finds it odd that people get attached to things. have dreams about what they want to be when they grow up. There really wasn’t another choice other than the leader of the Red Samurai. While she doesn’t have the proper training or the contacts anymore, ideally someday there would be a chance to fill those shoes. But otherwise, the game is enough. sense, to the colors he prefers, to the way he walks and speaks. Ro has no flaws, but isn’t very distinct, either. Her style is usually a very simplified version of whatever is stylish for the times. But she will look like whatever if it gives her an advantage in battle. Armor. Wedding Dress. Ganger clothes. Not really relevant. your character come to be known by his street name? Ro hasn’t had the chance to earn a nickname yet, but is looking forward to the opportunity. Ro nicknamed herself “Winter Elk” after being overcome by fear while fighting the paracritter. Paracritter’s seem to be her one weakness, despite all she knows of their ways. She recently found out what happened to her parents: they were liquidated, due to their unauthorized experiment, as were most of the other test subjects (Ro’s creche growing up). Ro’s father was captured while on a pleasure boating trip with Ro, explaining some of her strange emotional response to watercraft.